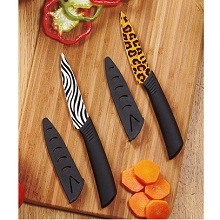 Lightweight and extremely sharp, this Animal Print Ceramic Knife gives your food prep extra flair. Ideal for precision cutting, its strong ceramic blade never needs sharpening and will not rust. It has an easy-grip coated plastic handle to prevent slipping. Includes a sheath for storage and travel. Hand wash. 3-1/2″ Blade. The strongest blade you can get!